I am really glad that someone is looking into this. We all know that having homeless people is costly to a society. There are financial costs, environmental costs, as well as social and moral costs. It is really difficult to quantify how much homelessness affects our society, and it is great that someone rolled up their sleeves and tried to crunch the economic numbers. They looked at medical costs, criminal justice system costs, and social services costs before and after housing. But there are a couple of caveats. The study determined that it makes fiscal sense for our society to pay for housing for homeless people. They looked specifically at the “tenth cost decile” (the 10% who were the most expensive homeless people in the system because of ER visits, hospitalizations, jail time, social service money, etc. ), and determined that when the 10th Decile People lived outside, they cost The System an average of $62,473 per year. 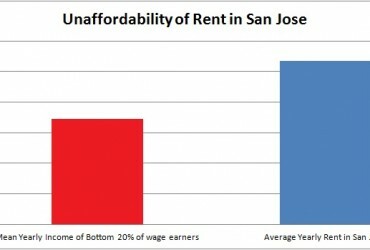 They then stated that after housing, they estimated that they would cost society an average of $19,767 per year. This results in an average cost savings to society of $42,706 per year, which sounds fantastic! But here come the caveats, which we summarize in the modified infographics below. Caveat #1: The post-housing number ($19,767) does not include the cost of housing. 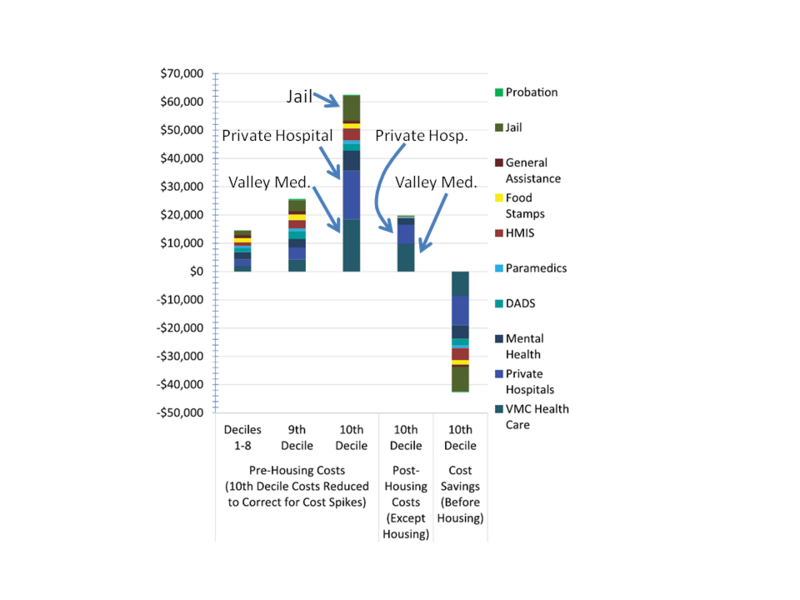 It only estimates the cost savings in healthcare utilization, criminal justice activity, jail and social services spending after a person is housed. Caveat #2: The pre housing numbers include a substantial amount of incarceration costs (about 15% of the pre-housed cost of services). The incarceration costs, by definition, go to zero in the post housing data. That’s of course true, but would be true whether or not the person was housed after incarceration. Caveat #3: The post-housing number ($19,767) does not include any data from our homeless population in San Jose. According to the study’s author, at the time the study window closed in 2012, they were not able to find enough housed study participants to collect post-housing data. 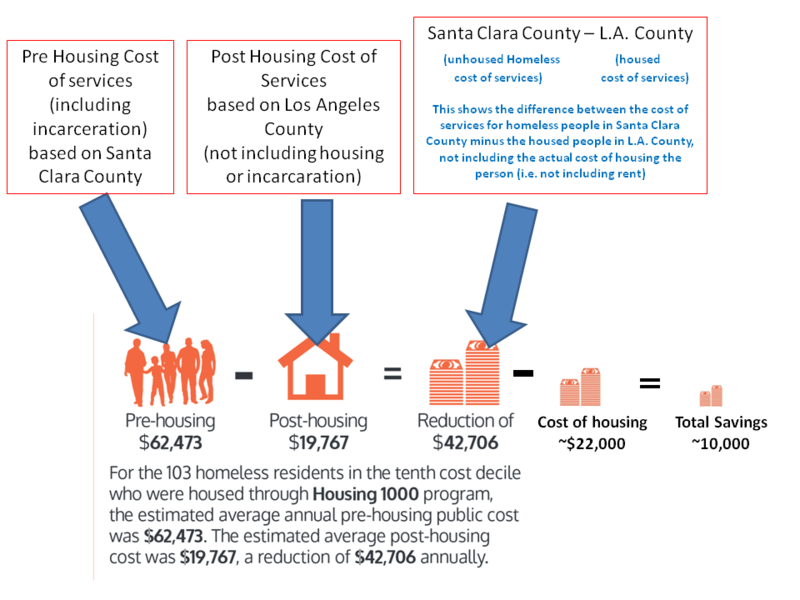 So, they matched San Jose homeless study participants with homeless people in Los Angeles with similar characteristics who had been housed previously and had participated in a different study, then used the LA data to estimate the post-housing costs in San Jose. A little research sleight of hand perhaps, but the study’s author says he is confident that the subjects were well matched and the data should be accurate. Caveat #4: All of these numbers apply only to the Tenth Cost Decile. Housing younger, healthier homeless people who stay out of legal trouble results in less cost savings. But one could argue that they would be easier to house, and would be more likely to stay housed, with less need for intensive case management. Ultimately, I am glad they are studying this and I am thrilled that more and more people are interested in helping our homeless neighbors go to stable, safe living environments. 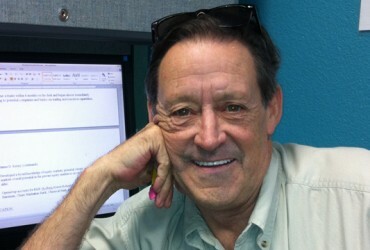 Destination:Home does really good work, pushing for more and more housing opportunities for the homeless. I believe that there is a moral imperative for our society to care for our poor neighbors and alleviating their suffering. I also believe that scientific research is helpful in guiding our leaders to make wise decisions about how to spend our collective money, and that full disclosure is important. I would like to see the little (not statistically significant) data they did collect on San Jose’s 10th Decile homeless, as this could give us clues about what does and does not work in housing the 10th Decile People as we wrestle with possible solutions. And I hope that more and more data will come with time as the Office of Supportive Housing works hard, housing more and more formerly homeless people. Edited inforgraphic from Destination: Home, showing the source of data from Santa Clara County and L.A. County. Annotated Infographic from the Home Not Found Report.